The Dark Knight Rises: Wasn't This Supposed To Be a Batman Film? THE DARK KNIGHT RISES is like Bane – big, talks too much, eloquence masking shallowness, can be easily cast aside.. So all of this aside, what do I think of the movie itself? Well, it doesn’t feel like a Batman story. Batman doesn’t really do any detective work or fight crime this time; instead he’s a revolutionary or freedom fighter battling an extreme terrorist. I think every review by now has raised all the main points. Overall, it’s enjoyable as a guilty pleasure, and is certainly epic in scope, but has tons of story problems. 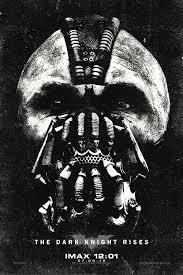 On the positive side, Bane, as interpreted by Tom Hardy, is a good villain, though he is more fun than creepy. His campy voice has led to many imitations in the past year (“Now’s not the time for fear” and “It would be extremely painful” have become popular one-liners) and he is introduced in a highly implausible scene on a plane that tries too hard to copy the opening bank heist of the previous film. Meanwhile, Bruce Wayne has some nice scenes as he slowly puts the cowl back on. His dynamic with Catwoman is good, and the scene where Alfred “breaks up” with him and leaves has some of the best acting in the entire trilogy. Most of all, it is interesting to see Batman come back after eight years…only to fail and be beaten badly by his opponent.